We have already mentioned in our previous issues that the DMT molecule has established a kind of bridge between the substance and its substance-wise perceptions. The DMT molecule has a very important effect. It also changes the way we perceive time. DMT, which is secreted by the epiphysis for a very short period of time, has effects that can give us hundreds of years. 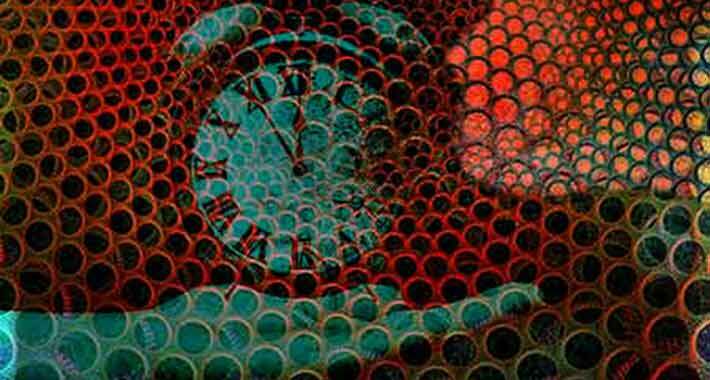 The concept of time begins to work in a way that is very different from the material dimension. One of the users who participated in the survey explains the situation in a very good way: “1000 years of experience in 15 minutes” (Patricio Dominguez) you live for a thousand years, when you wake up, it only takes you 15 minutes, 1000 minutes in 15 minutes … (Related part in video 44.27 ‘ I do not think there is an intensity that cannot be overcome by minds that have not studied the transpersonal perception but have not seen the change in the perception of time. We all have experienced the variability of time in a way. When we are bored, when we are in an environment that we do not want, and we do not know how to spend time on a boring journey, we do not know how it is when we enjoy, enjoy, enjoy. DMT can also be an effective factor in our daily life, if all the changes that occur in our body and soul world are related to chemicals, hormones and molecules. When we dream, when we cut off the link with the substance world, the dmt ratio in the deep trans states and the dmt ratio in our daily life, where our consciousness is open, may be different. DMT ratio can be changed with spiritual studies without external DMT. It is stated that the pineal gland is the section about the secretion of DMT. (Rick Strassman – Psychologist) Although it is said that this is not scientifically proven, no one receives DMT from outside and no external DMT is needed when we are dreaming. DMT is effective in the realization of certain moods, the documentary and Ayahuasca users in similar situations are transferred, the experience of those who live with the spiritual experience of the DMT area in the outside or in a different part of the pineal gland, DMT is a molecule that can be produced in the human brain. Similar to the DMT effect, deep trans studies and those who perform dhikr studies have similar effects to those who take meditation or breathing exercises for a long time. Whatever the name of the study, all the travels made from the material level to the depths of the soul enable us to experience the events we cannot encounter in our daily life. If you’ve done it before or after that, you’ll find something interesting. A short moment; There is an interesting detail in the transition from the material surface to the spiritual levels. You may experience a density that can be expressed in 1 second or 3 seconds or even years. This density is so high that only the traces remain, but not all of them can be solved. This fleeting track of the past and you can not describe, but lived in the details of the future you can say “I have lived before” details of the flow. Then you’re left with a mystical experience of peace in a great void. This is similar to the fact that hours of dreams actually take place in a very short time. The difference is that the dreams occur in the range that we can solve. At such moments, the DMT may only come into play simultaneously with certain brainwaves in the opening of the spiritual contact points. Excessive DMT purchases, such as the Ayahuasca experience, may have that short period of time, which directly transcends the moment of transition, and then carries it later. To live this moment, without any need to buy DMT from the outside, you will experience any transa transition that will make this effect more healthy and natural. Conscious dream studies, astral travel studies have important effects at this stage. It is sufficient to carry out the works that increase the spiritual deepening regularly. In addition to the food you will take your attention to the effects you want will live without any need. The experience of the Ayahuasca experience and the experience of conscious dream or deep trans phase only has uncontrolled depth difference. If we combine all the details we can reach this judgment. DMT ratio is effective on mental experiences and perception of time. As the DMT ratio increases, our understanding of the time gains a spiritual dimension, while the DMT ratio decreases to a material dimension. What are the factors affecting the DMT rate or DMT secretion of the Pineal gland? Apart from psychological influences, our eating habits have a big impact. At this point, I would like to draw your attention to a subject, regardless of which religion the priorities of those who do spiritual development work are the restriction and selective treatment of the foods taken. Food intake is reduced. Studies have shown that fasting has a positive effect on DMT production. (Rick Strassman – Psychologist) All foods taken and their rates affect metabolism and spiritual communication. In other words, every food received interacts with each other and affects the connection in spiritual dimensions. Everything that affects the substance body has effects that regulate the connection with the Spirit. Foods that affect the healthy functioning of the pineal gland also alter the amount of DMT or the rate of secretion. The differentiation of time perception from 50-100 years ago can be evaluated in this aspect. We may not know exactly what kind of effects the products used to benefit in a field have in other areas. DMT is said to be in all plants and animals, plants interact with other organisms through this molecule. (Graham Hancock – Author, Dennis McKenna – Psychologist) Nowadays, a significant portion of the foods produced are similar to nature, meaning that they are not natural, but they are similar to nature. What kind of effects can be on non-natural products, genetically modified foods, natural DMT secretion and human? Researchers in this area have information about the effects of fluoride on the epiphysis. If the fluoride really affects the operation of the pineal gland, then the DMT secretion is certainly affected. What is the difference between the perception of time and its current perception before the introduction of fluoride if DMT has an effect on time perception?